Herman is back, and this time he’s ready to spend a fun-filled night with his Street Monster friends. But when Cornelius insists on being a grump, Herman and the others will have to find a way to cheer their buddy up—perhaps with a new monster song. 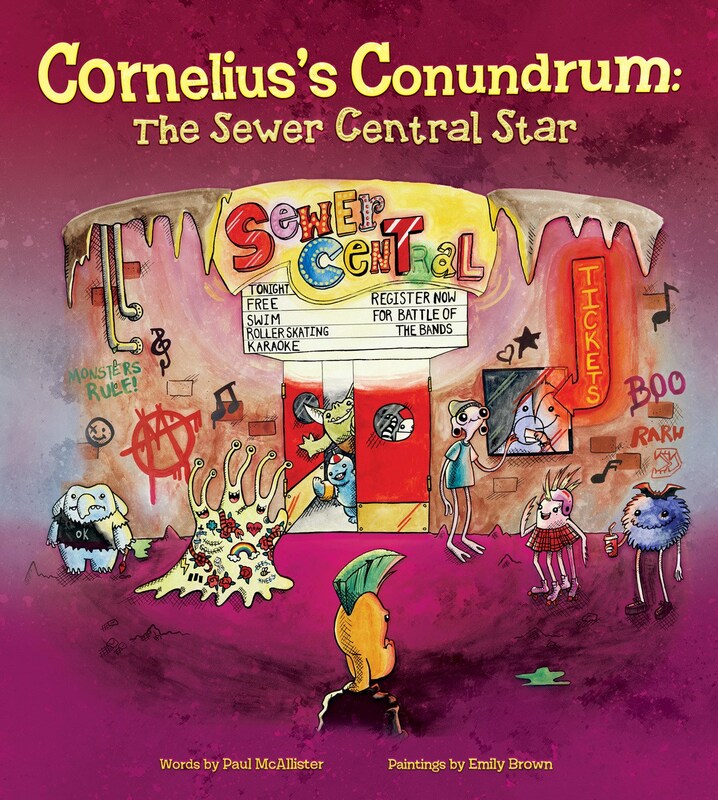 Cornelius’s Conundrum: The Sewer Central Star, written by Paul McAllister and Illustrated by Emily Brown, is the third book in the “Herman the Monster”’ series. In this installment, Herman and his friends are trying to have an exciting night out, but Cornelius (a Street Monster) keeps ruining the fun by being mean. In an attempt to make him happier, Herman and the others decide to form a band and compete in a singing competition. But when Cornelius continues to shove, tease, and sulk, he gets the inspiration he needs from his rocking idol, Cha Cha Pompadour. The message of this story is, ultimately, one of learning to control your emotions and be kind to your friends. But the path Cornelius’s Conundrum takes to reach this conclusion is a little muddled. Cornelius teases and physically harms his friends. But instead of telling Cornelius that they won’t spend time with him while he’s behaving so harshly, Herman and the other monsters try to appease his mood by entering into a band competition because they know Cornelius is happiest when he is singing. They brush off his behaviour as Cornelius’ simply being a “grouch”, and, at the end of the story, they forgive him without getting any real explanation of why Cornelius behaved badly in the first place. Likewise, while it’s eventually revealed that Cornelius bullies his friends to appear tough (and later to cover up his stage fright), Cornelius has no apparent reason for acting mean in the beginning of this story—his being tough is not something the other monsters care about, or even seem to actually expect. When Cornelius does admit he feels badly about his behaviour to Cha Cha, the rock idol teaches Cornelius a song he can sing whenever he’s about to lash out. Cornelius then sings this song with his band of monster friends, and it becomes a new hit tune. The quick way Cornelius apologizes and is forgiven by his friends, along with the abrupt change from Cornelius’ learning to recognize and control his own emotions to the band’s giving a smash hit performance, makes the ending of Cornelius’s Conundrum disjointed. There is an oversimplification of the topic of bullying here, and the book would have been stronger if more time had been dedicated to fleshing out the bullying plot—or if that plot had been scrapped altogether in favour of a tale more wholly dedicated to the formation and performance of Herman’s band. As with previous tales in the Herman series, Emily Brown’s illustrations continue to be a highlight in Cornelius’s Conundrum. The monsters all have their own distinctive personalities, and—despite being monsters—they are friendly-looking creatures that readers will love to cheer on. This is a colourful book, with a wide array of background and accent shades, such as the pale pink of Sarah’s café at sunset, the green slime of the sewer pools, and the punk-inspired red and black backstage of the performance hall. The illustrations also add some fun touches to the concert venue, with tattooed monsters and graffiti-covered walls giving readers something extra to explore as they flip the pages. Fans of the previous two Herman adventures, There and Back Again, A Herman Tale and A New Song for Herman, will enjoy seeing the monster friends again in Cornelius’s Conundrum: The Sewer Central Star. But the lack of a truly satisfying ending, along with a questionable message about the reasons for (and solutions to) bullying behaviour, will leave many readers wanting a bit more. Meredith Cleversey, a librarian in Cambridge, Ontario, loves to read, write, and live in a world of pure imagination.